Starfall's excellent interactive treatment given to the letter "U u”, with emphasis on the sound of the letter. Several examples and very clear pronunciation. Proeven van techniek is opgesteld op het niveau van het kind. Het bevat negen fiches. 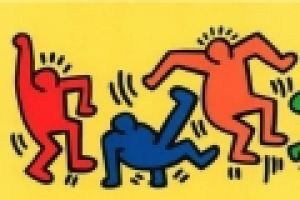 Op dit invulblaadje vind je vragen bij online informatie over kunstenaar Keith Haring. In bijlage vind je drie keer het hetzelfde bestand: als pdf als Worddocument en als Pages (iWork voor Apple). Nov. 3 - As Microsoft celebrates the one year anniversary of its Kinect motion sensor gaming product, the company is showcasing the Kinect Effect, highlighting uses beyond gaming. Bobbi Rebell reports. Nov. 6 - An asteroid the size of an aircraft carrier is expected to come within 201,000 miles of earth this week. Deborah Gembara reports. Research abstracts from a recent Department of Energy (DOE) genomics workshop are now available online. Researchers presented updates on DOE-funded genome research at this January 2002 workshop. Abstracts can be viewed within topical categories or by author name. Abstracts include title of the talk, author name, and contact information.